I did a post like this quite a long time ago, except I thought that I would do a little updated version of this "What I've Been Watching" post because over time I have found all kinds of incredible TV shows that I think are worth talking about. 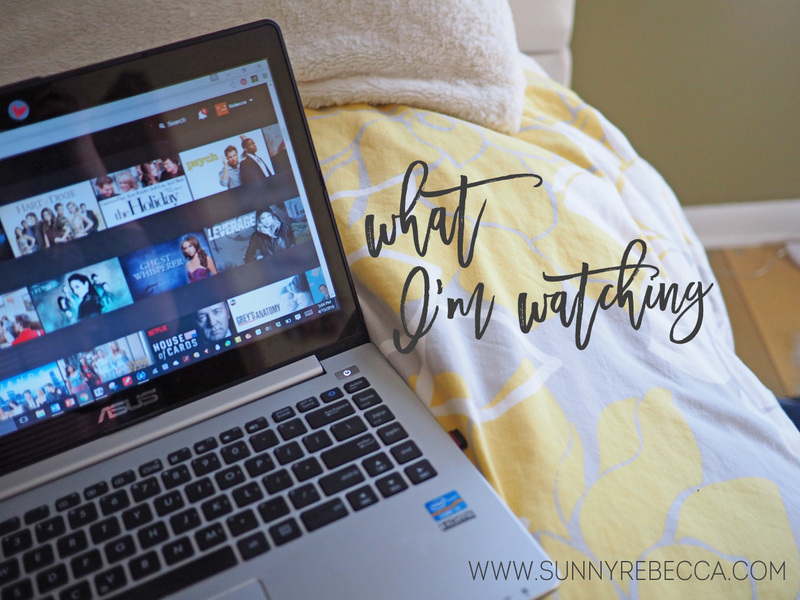 I love finding new TV shows to obsess over and I always appreciate recommendations, so I felt that I would do what I would love to receive and give out some recommendations of my own! About: While I know that it may sound a little crazy at first, this show is about a girl named Kimmy, who had previously been trapped in an underground bunker as a part of a doomsday cult against her will. She was been there for over fifteen years and when she was rescued, she wanted to put the past behind her. However, after being trapped there for years, she has had lots of trouble adjusting to the world. The show covers her personal discoveries and quirky adventures as she lives in New York City, working for the wealthy Mrs. Voorhees while she spends time with her friends, Lillian and Titus. Personal Opinion: Honestly, I didn't expect to like this because of how ridiculous it seemed at first. However, I actually really liked this show. Not only is Kimmy extremely ridiculous at some times, but she's also relateable at some others. It's funny, despite the fact that the story is totally unrealistic sometimes. About: Again, like the Unbreakable Kimmy Schmidt, this show is also incredibly unrealistic, but at the same time, sooo enjoyable. The show is about a girl named Jane, who lives with her grandma and her mom. Her mom gave birth to her as an unwanted pregnancy and Jane has tried her whole life to avoid that by being a virgin. However, some crazy telenovela-type things happen and she gets pregnant after an artificial insemination. The show basically follows Jane's life as she's going through her crazy pregnancy, not to mention some even crazier things, like murder, drug dealing, affairs, and romance. Personal Opinion: This show may seem like absolute nonsense, but it's soooo addicting. It has themes about love and life, scandalous secrets, detective work, and a whole lot of drama. It's narrated like a telenovela, which is so creative. The narrator often even acknowledges how ridiculous some of the things are, but also clarifies things for the audience and keeps things interesting. About: The Mysteries of Laura follows a police detective and also a mom of twin boys. In New York, the main character, Laura works to solve murders, and is pretty good at it. However, plot twist, the captain of her precinct is also her ex-husband and father of her children. The show follows the precinct's adventures in crime solving. Personal Opinion: Honestly, I'm pretty sure that not a lot of people watch this show or have heard of it, but I love it. One of my friends also loves it and we used to watch it after school sometimes. I recently realized that I love a good detective show, I love guessing who I think did it, but I'm always wrong. It's the little things in there that are the giveaways! About: Olivia Moore, previously an overachieving medical student, attended a party that goes into chaos. At the party, she got turned into a zombie (crazy right?!) and it caused her to reevaluate her life. Not only does she need to eat brains to stay normal, but she gets visions of the memories of the people's brains that she ate. She gets a job at the morgue so that she can get brains, but she also eats the brains of murder victims in order to help find their killers through the visions. Personal Opinion: When I first started this show, I thought for sure that I wouldn't like it. I mean, like zombies? Really? I've never really liked zombies before, but this show puts the zombie thing in a totally different perspective, nothing like the Walking Dead. Like the Mysteries of Laura, I love the detective aspect in there, plus there's also a little side plot building up about spreading zombies. What TV shows have you been obsessing over? Jane the Virgin is completely addicting!! It's absolutely ridiculous and hilarious and heartwarming all at the same time. #TeamRafael! Also idk if you're looking to find anymore shows, but I'm currently rewatching The O.C. and remembering how good it is! What's the O.C.? I would love to check it out, I'm always looking for new shows! Unbreakable Kimmy Schmidt is so good! I haven't been able to watch the second season yet, but I'm looking forward to it! I'm currently watching the second season of Daredevil on Netflix. :) And I've heard so many great things about Jane the Virgin, so I'm definitely going to check that out! I just finished season two of Kimmy Schmidt and it was great! It's definitely leading to some great character development of Kimmy that we just didn't get in season one. I've never seen Daredevil, but if it's good, then I would love to check it out!